Home / Engagement rings: Custom Design / Solitaire Diamond / “Aries” Princess Cut in a cross weave setting. “Aries” Princess Cut in a cross weave setting. Side view of a cross weave setting platinum solitaire. The diamond in this ring is a princess cut, although it can be made with a number of diamond types. 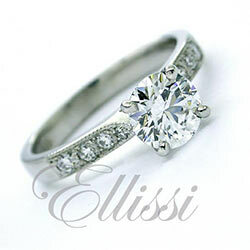 The crossed wires rise up from forming the curve of the band to the bridge collet above which they secure the diamond. Having a setting like this not only gives a pleasing shape to the ring design but also means the the ring can be set lower to the finger. Ring band width and profile are all optional as is metal type in platinum or gold.